An internationally recognized magician, he was a master illusionist, developer of magic tricks, the founding member of the Kidabra magician’s association, and owned a magic shop in Ohio. Always an entertainer, he renamed his funeral to “Fun-eral” and sponsored a party at a local steak house for the occasion. Four Santas were present at his “Fun-eral,” where his fellow magicians broke his “magic wand” in recognition that the magic is in the man, not in the stick. 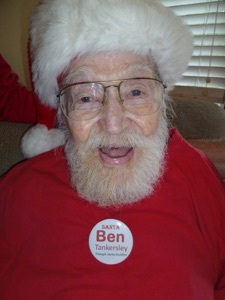 In the summer of 2013, at the age of 94, Santa Ben was recognized as “the oldest living Triangle Santa Buddy.” He recited and pledged the Santa Oath, sang the TSB anthem, “Here Comes Santa Claus.” Thereafter, every hospice visit with Santa AL was a TSB meeting. He had done Santa work and voicing in northern California before moving to North Carolina for terminal health care. Santa Mark was an active Triangle Santa Buddy for several years. 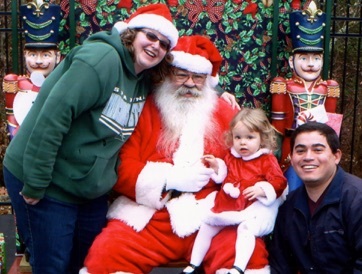 Challenged by debilitating diabetes, he continued to do Santa work. A year before his last sleigh ride he received recognition from one of his churches for 30 years of service as Santa to the church. 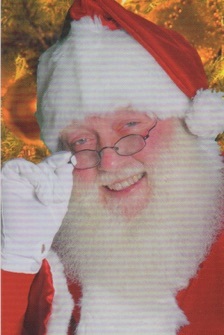 His positive outlook and twinkling eyes informed his Santa character. His craftsman’s skill was reflected in his dental prosthetics business and in his fine furniture. Thank you, Santa Mark, for sharing the spirit of Christmas through the presence of Santa Claus. The tiny lights like heaven’s stars reflecting on the snow. But the sounds of music can’t compare with the Christmas choir we have up here. Words beyond description, to hear the angels sing. For some the journey’s quicker, for some the journey’s slow. And find the everlasting peace, together with the Lord. But remember that I am spending my Christmas with Jesus Christ this year. 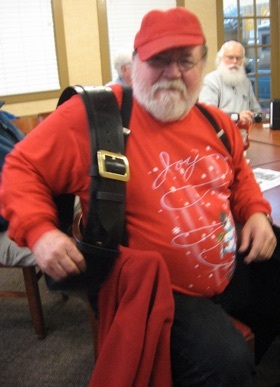 Santa Pete joined the Triangle Santa Buddies in 2011. His other character was the Leprechaun in Raleigh’s St. Patrick’s Day Parade. A printer by trade he was a singer, story teller, song writer, guitarist, musician produced 3 albums of original music. Founder & leader of Democratic Men’s Group of Raleigh. Lead conferences, programs and activities of Unitarian Universalism including the rebuilding of Shelter Neck Unitarian Universalist Camp in Pender County, NC after the 1999 hurricane and flood. He was a regular at O’Malley’s Irish Pub. Santa Howard Weaver was a long time member of the Triangle Santa Buddies. As a carpenter he built his own sleigh and a couple of plywood reindeer for his Santa set at the Lowes Grocery store at Chatham Crossing. 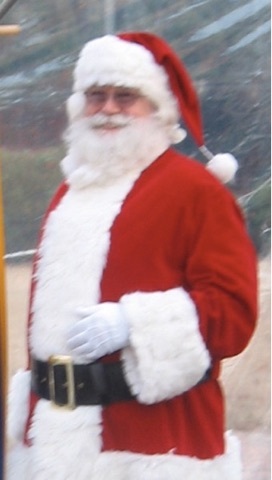 He was Pittsboro’s Parade Santa in his red pickup truck and did other special events. 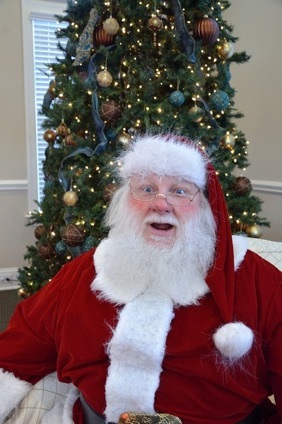 A beloved Boy Scout leader for Brown’s Chapel UMC Pittsboro, his kindness, care, compassion, joy, hope and delight in life was the Santa Spirit he shared with children of all ages. 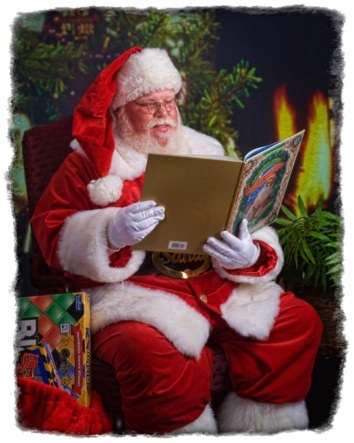 Santa Rick joined the Triangle Santa Buddies in 2013. However he has been doing Santa work for over 30 years having started as a young man. His sports interest and knowledge have him being Santa to professional clubs, teams and corporate boards all along the East Coast. He enjoyed using accessories when working as Santa. He was generous in sharing his accessories with his Triangle Santa Buddies. Santa George was a founding member of the Triangle Santa Buddies. 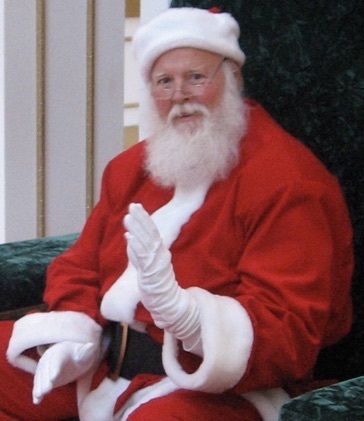 He received his diploma in SantaClausology upon graduation from the International University of Santa Claus. He had worked in local malls, parades, photo studios, country clubs, the Pullen Park Train, Raleigh’s Celebration of Lights and private appearances. He was quiet and easy going. He spent his summers as an instructor at the Summer Boy Scout Camp. 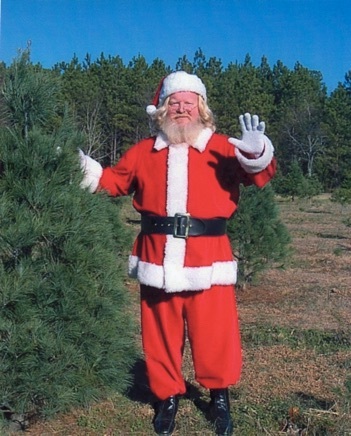 Santa Dwight is a founding member of the Triangle Santa Buddies and has over twenty five years of experience. 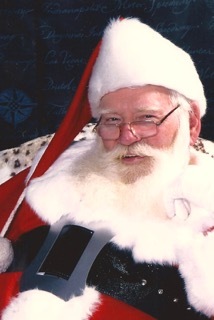 He has been a mall Santa in Durham and Raleigh. Santa Charlie, is an early member of the Triangle Santa Buddies. He has done parades, home visits and for the past two years been a “tag team Santa” at Crabtree Valley Mall with his long time Santa Buddy, Santa Dwight Compton of Cedar Grove. His custom red corduroy suit was fashioned by a local Oxford seamstress.